The object of this study is the evaluation of cadmium removal from industrial wastewater by electrocoagulation process. For this study a glass tank in 1.56 L volume with four plate electrode was used to do experiments. The electrodes made of iron and connect to the positive and negative pole of DC power supply (bipolar mode). The tank was filled with synthetic wastewater that was containing cadmium ion in concentration 5, 50 and 500 mg/L and then it was started up. The percent of cadmium ion removal was measured at pH 3, 7 and 10 and in electric potential range of 20, 30 and 40 volts. At the end of each stage of experiment, volume of produced sludge was measured. The results obtained at different electrical potential showed that initial concentration of cadmium can effect on efficiency removal and for higher concentration of cadmium, higher electrical potential or more reaction time is needed. On the other hand, if the initial concentration increases, the time required of process should increase too. The final pH for iron electrodes was always higher than initial pH. As expected, the results showed that for a given time, the removal efficiency increased significantly with increase of current density. The highest electrical potential (40V) produced the quickest treatment with >99% cadmium reduction occurring after only 20 min. The result showed that, in this process, the use of different electrical potentials can provide a wide range of pH for doing this process and electrocoagulation process (using iron electrodes) is a reliable, safety, efficient and cost-effective method for removal of cadmium from industrial effluents, especially designed for pH =10 and voltage = 40V. Heavy metal species are some of the most common pollutants that are found in industrial wastewaters. Because of their toxicity, these species can have a serious impact if released into the environment as a result of bioaccumulation, and they may be extremely toxic even in trace quantities. One such a heavy metal, cadmium, along with its compounds, is widely used in pigments, as heat stabilizers for plastics, for corrosion resistance of steel and cast iron, metal plating, phosphate fertilizer, mining, pigments, alloy industries, in soldering and brazing, and in the battery industry (Ni-Cd batteries). Cadmium is highly toxic and there is some evidence that it is carcinogenic (Hiatt and Huff, 1975). The harmful effects of Cadmium include a number of acute and chronic disorders, such as "itai-itai" disease, renal damage, emphysema, hypertension, and testicular atrophy (WHO, 1984; Leyva-Ramos, 1997). When ingested by human beings, cadmium that is not excreted immediately has a long half-life of several hundred days, so that a low dose exposure over a long period of time can lead to a high body burden. In view of its persistence as a cumulative poison and the low tolerance of the human body towards cadmium, it is of interest to develop schemes for the removal of heavy metals from wastewaters prior to their disposal. Such disposal is, of course, subject to strict environmental regulation. In the case of cadmium, for example, the immobilization and remobilization of Cd(II) by ferrihydrite, and the effect of Cd(II) on the conversion of ferrihydrite to goethite and hematite has been reported previously (Sun et al.,1996 ; Lin et al., 2000) . The drinking water guideline value recommended by World Health Organization (WHO) is 0.003 mg Cd/L (WHO, 2003). The goal of this research was to study the efficiency of electrocoagulation process to removal of cadmium from industrial effluents (such as plating bath wastewater) with iron electrodes and determination of the effects of voltage, pH and reaction time on the removal efficiency of cadmium. 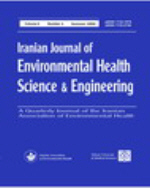 This study has been conducted in the environmental chemistry laboratory of School Health of Tehran University of Medical Sciences in late 2006. All chemicals including cadmium nitrate, sodium hydroxide pellets, concentrated sulfuric acid and potassium chloride were used as received from Merck Company. Desired concentrations of cadmium solution were prepared by mixing proper amount of cadmium nitrate with deionized water. In order to increase the conductivity of the solution to 1.6 mS/cm, potassium chloride (1 N) was added to the solution before injecting it into the apparatus. The chloride salt added to the solution can also prevent the formation of the oxide layer on the anode and therefore reduce the passivation problem of the electrodes. The pH of influent solution was adjusted by using sulfuric acid solution and sodium hydroxide (0.1 M). Experiments were performed in a bipolar batch reactor (Fig. 1), with four iron electrodes connected in parallel (bipolar mode). Only the outer electrodes were connected to the power source, and anodic and cathodic reactions occurred on each surface of the inner electrode when the current passed through the electrodes. The internal size of the cell was 10 cm × 13cm × 12 cm (width × length × depth) with an effective volume of 1000 cm3. The volume (V) of the solution of each batch was 1 l. The active area of each electrode was 10× 10 cm. The distance between of electrodes was 1.5 cm. respectively. A power supply pack having an input of 220V and variable output of 040V with maximum current of 5 ampere was used as a direct current source. chromium solution turbidity until 10, 50 and 200 NTU values are attained. In order to study the effect of organic matter presence (such as COD) on chromium removal by electrocoagulation process, a set of experiments with different initial concentrations of COD (100, 500 and 1000 mg/L O2) were performed under optimum conditions (pH=3, Time=60 min, Voltage= 40 V). Standard solution of COD was prepared by dissolving 8.502 g of Potassium hydrogen phthalate (KC8H5O4) in distilled water and diluted to 1000 mL. The prepared solution has a theoretical COD value of 10000 mg/L. 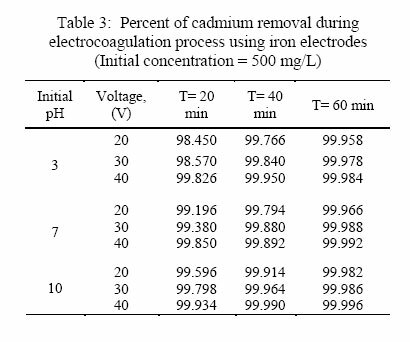 The results of cadmium removal for various initial concentrations 5, 50 and 500 mg/L, by electrocoagulation process using iron electrodes are shown in Tables 1, 2, and 3. The results of these Tables illustrate that cadmium removal efficiency for different conditions such as initial pH and electrical potential is significant (>90%). 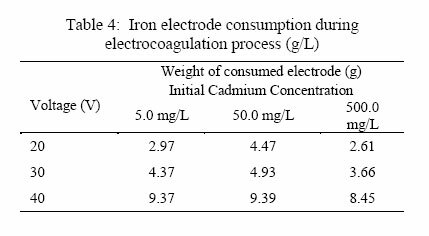 Table 4 illustrates the results of consumed iron electrode during electrocoagulation process for various pH and cadmium initial concentrations. With increase in electrical potential (voltage), the amount of electrode consumption increased, too. So, the highest electrode consumption observed at electrical potential 40V. 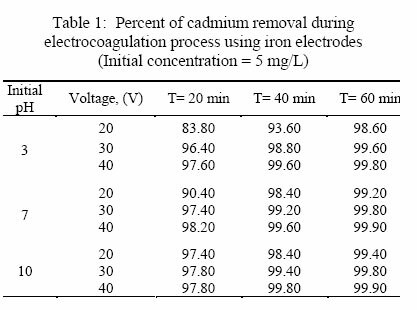 Table 5shows amount of consumed energy during electrocoagulation process at voltage 40V and for different initial concentrations of cadmium. These results illustrated that consumed energy decreased with increase in cadmium initial concentration. In the present study, electrocoagulation process has been evaluated as a treatment technology for cadmium removal from industrial effluents. Cadmium removal efficiency at different condition (pH, electrical potential) in various times was evaluated. It has been established in previous studies (Vik et al., 1984; Chen et al., 2000) that pH has a considerable effect on the efficiency of the electrocoagulation process. Also, as observed by other investigators the pH of the medium changed during the process. This change depends on the type of electrode material and initial pH. In this study, the pH was varied in the range 310 in an attempt to investigate the influence of this parameter on the removal of cadmium. Removal efficiencies of cadmium as a function of initial pH with iron electrodes are presented in Tables 1, 2, and 3. As observed by other investigators (Vik et al., 1984), a pH increase occurs when the initial pH is low(< 7). Vik (Vik et al., 1984) ascribed this increase to hydrogen evolution at cathodes. However, this was contested by Chen (Chen et al., 2000), who explained this increase by the release of CO2 from wastewater owing to H2 bubble disturbance. Indeed, at low pH, CO2 is over saturated in wastewater and can release during H2 evolution, causing a pH increase. In addition, if the initial pH is acidic, reactions would shift towards which causes a pH increase. In alkaline medium (pH > 8), the final pH does not vary very much and a slight drop was recorded. This result is in accord with previously published works and suggests that electrocoagulation can act as pH buffer. In this research, the influent pH did not affect the removal efficiencies significantly over a wide range. Therefore, pH adjustment before treatment is not required in practical applications. The highest efficiency of cadmium removal observed in alkaline medium (pH=10). The pH variation of solution after electrocoagulation process in various voltages showed that the final pH for all of experiments with iron electrodes is higher than initial pH, which is in agreement with results obtained later (Kobya et al., 2003). Preliminary laboratory testing of the electrolysis cell involved determining the effect of applied voltage on the efficiency of cadmium removal. It is well-known that electrical current not only determines the coagulant dosage rate but also the bubble production rate and size and the flocs growth (Letterman et al., 1999; Holt et al., 2002), which can influence the treatment efficiency of the electrocoagulation. Therefore, the effect of current density or electrical potential (voltage) on the pollutants removal was investigated. As expected, it appears that for a given time, the removal efficiency increased significantly with increase of current density. The highest electrical potential (40V) produced the quickest treatment with >99% cadmium reduction occurring after only 20 min and the lowest cadmium removal efficiency occurred in the lowest electrical potential (20V). This is ascribed to the fact that at high current, the amount of iron oxidized increased, resulting in a greater amount of precipitate for the removal of pollutants. In addition, it was demonstrated that bubbles density increases and their size decreases with increasing current density (Khosla et al., 1991), resulting in a greater upwards flux and a faster removal of pollutants and sludge flotation. As the current decreased, the time needed to achieve similar efficiencies increased and the results of this research confirm this fact. This expected behavior is explained by the fact that the treatment efficiency was mainly affected by charge loading (Q = It), as reported by Chen (Chen et al., 2000). However, the cost of the process is determined by the consumption of the sacrificial electrode and the electrical energy which economically are the advantages of this method. These results suggest 40V as an optimal electrical potential for the treatment of effluents containing cadmium, since it ensures the quickest removal rate with the lowest cost. A set of experiments was performed with different initial concentrations of cadmium to determine the time required for removal under various conditions of electrocoagulation process. The results obtained at different electrical potential showed that initial concentration of cadmium can effect on efficiency removal and for higher concentration of cadmium, higher electrical potential or more reaction time is needed. On the other hand, if the initial concentration increases, the time required of process should increase too. And, also it is clear from Tables 1, 2, and 3 that in the higher the concentration, the greater the time needed for removal of cadmium, but that higher initial concentrations of cadmium were reduced significantly in relatively less time than lower concentrations. The time taken for reduction thus increases slowly with increases in concentration. This can be explained by the theory of dilute solution. In dilute solution, formation of the diffusion layer at the vicinity of the electrode causes a slower reaction rate, but in concentrated solution the diffusion layer has no effect on the rate of diffusion or migration of metal ions to the electrode surface (Chaudhary et al., 2003). The method was found to be highly efficient and relatively fast compared to conventional existing techniques and also, it can be concluded that the EC process has the potential to be utilized for the cost-effective removal of heavy metals from water and wastewater. 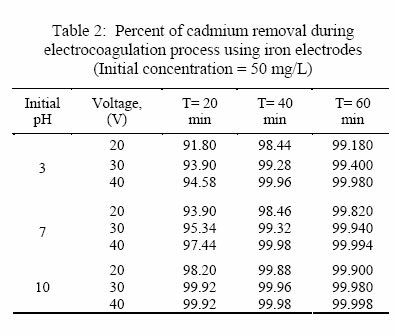 The time dependence of cadmium removal by electrocoagulation process at different pH is shown in Tables 1, 2, and 3. It can be seen from the tables that up to 83-99 % of the initial concentration decreased within 20 min of the process at different concentrations and the residual cadmium concentration in effluent were less 1.0 mg/L and finally at the end of reaction time (60 min) reached to < 0.003 mg/L, which is the recent guideline value of WHO (WHO, 2003) so we can discharged treated effluents to environment, in safety. At the beginning of process the cadmium removal is rapid and later it decreased gradually over almost the entire process examined. Cadmium ions are more abundant at the beginning of the electrocoagulation process, and the generated iron hydroxides due to corrosion of the anode at that time will form complexes with cadmium and therefore rapid removal of cadmium was observed. A set of experiments was performed with different initial concentrations of chromium (5, 50 and 500 mg/L) to examine the effect of the presence of organic matter (such as COD with concentration 100, 500 and 1000 mg/L O2) and various levels of turbidity (10, 50 and 200 NTU) in wastewater on the removal efficiency of chromium. The results obtained at optimum conditions (pH=10, reaction time =60 min and voltage = 40V) showed that the removal efficiency for various concentrations of chromium was unchanged and hence the electrocoagulation process can be applied efficiently for chromium removal in presence of organic matter and turbidity. A series of tests were conducted with different concentrations of cadmium in the solution and the weight of the electrode consumed with respect to different voltage levels is given in Table 4. As shown in the Table, it can be concluded that the higher the applied voltage, the higher the weight of the electrode consumed. Also, higher initial cadmium concentrations in the solution result in higher electrode consumption weights. As the Table illustrates, the weight of electrode consumed at 40 volts is much higher that that at 20 volts. Also, an increase in initial cadmium concentration to 500 mg/L, does not result in an important increase in electrode consumption. However, at this concentration, coagulation has taken place and the high formation of the flocs has helped the complexation of cadmium and there was no need for much consumption of the electrode as at low initial chromium concentrations. Tables 5 shows energy consumption results for the removal of one gram of cadmium at 40V, initial chromium concentrations of 5, 50 and 500 mg/L, and pH 3, 7 and 10. It can be concluded that the consumed energy decreased with increase in initial cadmium concentration, because the flocs formation will help the adsorption of the cadmium from the solution. Finally, it can be concluded that electrocoagulation method is a reliable, safety, efficient and cost-effective method for removal of cadmium from industrial effluents, especially designed for pH = 10 and voltage = 40V. On the other hand, in this study it was shown that electrocoagulation process using iron electrodes achieves a fast and effective reduction of cadmium (more than 99%) present in industrial effluents (such as plating baths wastewater). Indeed, the reported results show that electrocoagulation is faster and more effective process as compared to other methods alone. Nevertheless, further studies should be carried out to confirm the practical feasibility of this method for treating various wastewaters and with different condition. This study was financially supported by Center for Environmental Researches, Tehran University of Medical Sciences: project NO. : 2711. APHA-AWWA., (1992). Standard Method for the Examination of Water and Wastewater, 18th Ed. USA. Chaudhary, A. J., Goswami, N. C., Grimes, S. M., (2003). Electrolytic removal of hexavalent chromium from aqueous solutions. J. Chem. Technol. Biotechnol., 78: 877883. Chen, X., Chen, G., Po, L. Y., (2000). Separation of pollutants from restaurant wastewater by electrocoagulation. Sep. Purif. Technol., 19: 6576. Clifford, D., Subramonian, S., Sorg, T. J., (1986). Water treatment processes. III. Removing dissolved inorganic contaminants from water. Environ. Sci. Technol., 20: 10721080. Hiatt, V., Huff, J. E., (1975). Environmental impact of cadmium. Overview. Int. J. Environ. Stud., 7: 277285. Holt, P. H., Barton, G. W., Wark, M., Mitchell, A. A., (2002). A quantitative comparison between chemical dosing and electrocoagulation, Colloids Surf. A: Physicochem. Eng. Aspects., 211: 233248. Karthikeyan, K. G., Elliott, H. A., Cannon, F. S., (1996). Enhanced metal removal from wastewater by coagulant addition. Proc. 50th Purdue Industrial Waste Conf., 50: 259267. Khosla, N. K., Venkachalam, S., Sonrasundaram, P., (1991). Pulsed electrogeneration of bubbles for electroflotation. J. Appl. Electrochem., 21: 986990. Kobya, M., Taner-Can, O., Bayramoglu, M., (2003). Treatment of textile wastewaters by electrocoagulation using iron and aluminum electrodes. J. Hazard. Mate., 100: 163178. Kongsricharoern, N., Polprasert, C., (1995). 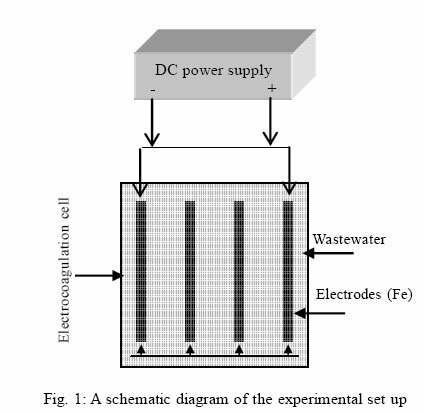 Electrochemical precipitation of chromium from an electroplating wastewater. Water Sci. Technol., 31 (9): 109-117. Letterman, R. D., Amirtharajah, A., O'Melia, C. R., (1999). A Handbook of Community Water Supplies. 5 Ed., AWWA, Mc Graw-Hill, N. Y. USA. Leyva Ramos, R., (1997). Adsorption of Cadmium (II) from aqueous solution on to Activated Carbon. Water. Sci. Technol., 35: 205-211. Lin, X., Burns, R. C., Lawrance, G. A., (2003). Effect of Cd (II) and anion type on the ageing of ferrihydrite and its subsequent leaching under neutral and alkaline conditions. Water. Air. Soil. Pollut., 143: 155177. Patterson, J. W., (1985). Industrial wastewater treatment technology. USA: Butter worth publishers. Sun, Y., Paige, C. R., Snodgrass, W. J., (1996). The effect of cadmium on the transformation of ferrihydrite into crystalline products at pH 8. Water. Air. Soil. Pollut., 91: 307325. Vik, E. A., Carlson, D. A., Eikum, A. S., Gjessing, E. T., (1984). Electrocoagulation of potable water. Water Res., 18: 13551360.
WHO, (1984). Guidelines for drinking - water quality. vol.2, Belgium, Macmillan. WHO, (2003). Cadmium in drinking water. Background document for preparation of WHO Guidelines for drinking-water quality. Geneva, World Health Organization (WHO/SDE/WSH/03.04/80).